From an old farm truck in South Carolina to a beautiful booze truck in Oregon, Betsy has undergone quite the transformation. 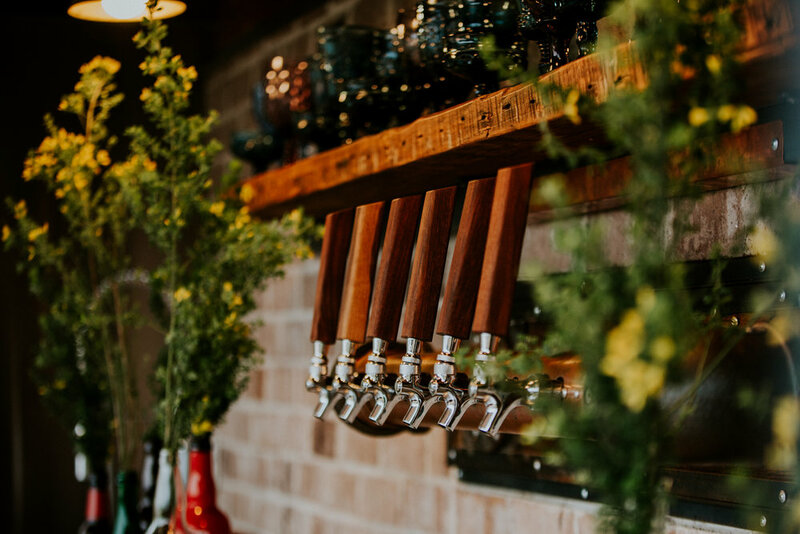 Fully stocked with six keg taps, a wet bar, brick backsplash, reclaimed wood tables and a staff of professionally trained bartenders — she's the perfect addition to any event where the style and character of your bar are as important as the drinks being served. No need for outside power, water or lighting. Our onboard refrigeration keeps your kegs cold while the gentle bar lighting ensures that your guests know exactly where to go. Whether we source power from the venue or our portable generator, Betsy is a standalone system so the drinks don't stop until you do. Our rental package includes a minimum of two top-notch bartenders, certified in OR & WA, so the line stays short. Always professional, attentive and dedicated to detail our staff is well-suited to match the vibe and wardrobe of your event. Yep, that's a real brick wall. We want your event to be as authentic as it is unique so we decked out Betsy with reclaimed wood paneling, tables and tap handles, along with a stainless steel countertop and brick backsplash. From company logos to wedding initials our custom vinyl decals make sure that Betsy blends in with any event. If you or your caterer don't want the hassle of curating the drink menu, we're happy to work with you to create a menu that ties together your theme and wows your guests. Featuring a special beer? Looking to add that final touch? We can easily swap out our wooden tap handles to give the bar the exact look you're going for. We custom tailor each rental package to meet your unique needs. Want to provide the product and bartenders? Great! Looking for full scale event bartending? We’ve got you covered. All of our events are quoted individually based on location, service duration, attendance and other factors. Our rental package allows the client to provide their own alcohol and glassware or have their caterer provide it. We are also able to build a beverage menu for you and provide all alcohol and non-alcoholic options for an additional cost. Please contact us so we can discuss your event and provide a more accurate quote!